I must say I enjoyed listening more to Messiaen on his interpretation of birdsong (and the blackbirds calling outside at this moment!) than his actual work, but perhaps the fault is mine. Your question – how can we do this in class – set me thinking a good half hour. I don’t think I have any answers which haven’t already been mentioned in your other blogposts and comments on task repetition, drilling, practiced control, except perhaps one: the game that’s similar to the boardgame articulate – getting students to guess what the activity/theme a student is trying to describe where he can’t actually use several keywords – the effort of trying to get it right would involve repetition both on the part of his audience and himself. Thanks, Mei- I don’t know ‘Articulate’ – what determines what the ‘key words’ are? But your idea reminded me of an activity I once watched that involved increasing degrees of challenge but also could involve repetition. The teacher started by saying: I’m from Mars. How do you boil an egg? One student started ‘You put the egg in some …’ and before she could finish, the teacher interrupted. ‘I’m from Mars. What’s an egg? At some point the repetition could be built in by having students recall the procedure thus far. Also, there’s the chain story idea, where one student provides the first sentence of a story (orally), and students take turns to continue it, a sentence at a time, but always going back to the beginning. Your chain story activity reminds me of some of the activities I used where the students sit in a circle and it starts There’s a chair in my room, the next student goes There’s a chair and a table in my room, depending on the number of students in the class the loop could go round a second time! There’s another circle activity where the students practise fortunately/unfortunately. I might start them off with – I forgot to bring my purse today. The next student has to continue – Fortunately, I’ve got a friend who can lend me some money. The next then might say something like Unfortunately, my friend is not here today. And so on. But not when he’s mad. And he’s in a rage. Just wanted to add that all the stuff I’ve mentioned here aren’t original – they’ve been around for such a long time I’m afraid I can’t remember who to attribute them to. I remember you using this remarkably simple – though when unpacked – quite profound expression, as a heuristic for teaching approaches. In light of the uncertainty of how learners actually learn, perhaps we should think of encouraging repetition – or iteration – by promoting a wide range of activities, some of which may focus on the more ‘static’ and some which are more open and flexible. There are so many activities already available that all a teacher need do is mine to vault and do their best to create an intelligent pick and mix. Oh, and let’s not forget the warm-up chat at the start of a lesson can be a – daily valuable source of iteration. ‘What did you do at the weekend/last night/yesterday?’ etc, can provide a great springboard for students to reiterate common expressions, while exploring new expressions with the teacher’s guidance. Alternating the ‘static’ and ‘dynamic’ elements of a lesson is a very suggestive idea, Avi. I can envisage the warm-up chat, taking the form of a student describing their weekend, and then the teacher periodically putting that student on hold (using an imaginary pause button! ), and getting another student to repeat what the first student had said thus far. The washback effect of students’ knowing this would happen might also raise the attention level – often a problem if someone’s weekend was particularly uneventful! Let’s play here. Try substituting ‘thermodynamics’ by ‘speechdynamics’, and ‘energy’ by’ language’. Do both illusions of systematicity check out? “The First Law of Thermodynamics tells us energy is conserved. The total amount never changes. But something does change. I will call it “re-usability”, for now. It’s not an official text book word, but pretty good for communicating the basic idea. Remember that there has to be an energy transfer for something to happen; energy changes form or moves from place to place (heat flow, for example). As energy moves and changes, the total amount of energy stays the same, constant forever as far as we know. That sounds good doesn’t it? But wait! If it’s forever, why are all these do-gooders telling us we need to conserve energy by using less? Can’t we just keep using it over and over? Why shouldn’t everyone drive to work alone in a 300 horsepower car? Alas, my friends, there is always a rub, and when it comes to energy, the rub is described by the Second Law of Thermodynamics. The first law would be quite happy to let us re-use energy over and over. The first law is happy as long as energy is conserved. It’s the happy law. The second law may seem a little less happy to some. It describes the aftermath of every energy change that makes something happen. The second law says that each time energy gets transferred or transformed, some of it, and eventually all of it, gets less useful. That’s the truth. It gets less useful, until finally, it becomes mostly useless (at least as far as its ability to make things happen is concerned)”. OK, J.J. – I see an analogy emerging here, but you might have to help me with it! Does repetition ultimately degrade the force of what is being repeated? How can we counteract this? I’m afraid your question calls for a Ph.d thesis. Would this have something to do with lexical priming acquisition or atrophy? I am NOT a musicologist, nor even a musician, Petra! So any analogies that I draw between language and music, or language learning and musical performance, have to be taken as simply that – analogies! But if they strike a chord ( 😉 ) so much the better! ‘In a complex system, what results from one iteration is used as the starting point for the next iteration. Thus, the starting point or initial condition is always different’. Mark, yes! That was basically what I was about to say (though far less eloquently). Plus, mastery of formulaic language might also, in the long run, prime students to “unpack” each chunk, take in the underlying grammar and then use it more flexibly. The notion that interlanguage restructuring may also take place through an initially “chunky” deployment of the new forms makes a lot of sense to me. Yes, Mark, I think that captures it well. I might add that the biggest single challenge (well, one of them) that we face as teachers is helping learners to transfer knowledge and skills that they have acquired and practised in the classroom to different (out-of-classroom) contexts. Being able to repeat sentences in the classroom (as in an imitation drill) is no guarantee, of course, that they will be able to do this. But maybe drills that involve some degree of variation (as in substitution drills) invest the language with a little more ‘transferrability’? Just a thought. I have found that 4-3-2 activities you mentioned in the task repetition blog and described in Nation’s Teaching ESL/EFL Listening and Speaking to be highly motivating for students in terms of fluency practice but there is a danger that the current flavour of the month ‘communicative approach’ with it’s focus on fluency over accuracy risks fossilisation of error. Apparently students thoroughly enjoyed the tasks and the technique very effectively promoted self-correction and noticing before the teacher’s feedback. I would be interested in seeing the task repeated after the transcriptions were analysed. Error on the side of caution……. I’ve had good experiences with that kind of recording/transcription repetition as well, but in addition to any error correction, teach students to look for the disjunctions in the conversation or avoidance “Um, you know, (unrecorded gesture and/or L1)”, “Umm, never mind, let’s talk about (abrupt shift of topic), or responses that don’t answer a classmate’s question or prompt. Then, they prepare language to speak to that the next iteration the following class. Also, err on the side of not doing this too much. It’s a lot of work for the students. Thanks Peter (and Ted)… yes, transcribing, as painful as it sounds (and, as you say, the students quite liked it) is an excellent way of ‘revisiting the same territory’. The extract they transcribe needn’t be that long either. (Transcribing a jointly constructed and recorded conversation is a key process in Community Language Learning – traditionally it was the teacher who transcribed the finished conversation on the the board, but there’s no reason it couldn’t be the students working together). Scott, the short answer to your (rhetorical?) question is ‘Dogme’, as far as I’m concerned. Unfortunately, many attitudes towards language learning, from both learners and teachers alike, seem fixated on repetition as such, without any appreciation of iteration as you’ve so well described it here. I think Avi’s suggested warm-up chat can become the heart of the lesson when the teacher keeps the rhythm and lets students improvise according to their individual talents and interests. Your variation on a theme complements my environs well: amidst the blackbird songs of Crete, as Jazz wafts (and warbles?) through the open air lobby and out onto the veranda overlooking Souda Bay. After a few days here, the Greek I can understand and use consists of the language (bits and bobs) that I need to let people know who I am and what I want and to discover the same about them. Wouldn’t a good teacher be the person who helps me find the flow each time I cross the river; someone who reminds me that no two Kali mera’s (Good morning’s) are the same? My system was simple. On my way down to the subway, I would look for older people who didn’t seem in a hurry and I would ask them how to get to an address. They tried to explain, and almost always they would ask me who I was, where was I from, and what was I doing in new York. Each time I understood a little more and I could answer a little better. This really is ‘revisiting the same territory’, and also, in Diane L-F’s terms, a good example of repetition ‘generating innovation’. Phrasal verbs! Each one has many context-sensitive meanings and new ones pop up like mushrooms on a rich woodland floor — and sometimes disappear as quickly. We’re told they’re so hard to “learn” … they can be idiomatic and slangy. So, excepting a few that are unavoidable, we collect them in a big basket and save them for high intermediate and advanced learners to study. But mushrooms (and all the other stuff that makes up a forest) arise from the iterative processes around them. The weather, the seasons, the living and dying of other beings. Mushrooms … um, or was that phrasal verbs? … are just especially ephemeral. Beating a sloppy metaphor to death here, maybe learners shouldn’t spend too much time with baskets of stale mushrooms but spend as much time as possible out in the forest participating in the process and noticing what pops up? In the classroom, the “forest” might be a certain broad subject. Staying in the same general environment allows for more repetition to be tried, experienced and observed. Even after we move on to the “meadow”, there can be comparing and contrasting with the “forest”. PS: love waking up to the blackbird songs, both sung and played. Similar to our American robin! I love it! We could maybe also consider genres (spoken, academic, etc.) as varying initial conditions. What meanings pop up in different situations? How? You’ve already mentioned some techniques such as 4-3-2 time constraint over at https://scottthornbury.wordpress.com/2010/12/05/r-is-for-repetition/ Here is one other type: lexical constriction. Meeting new students for the first time, many teachers use some “getting to know you questions or activities.” Or, these may come from a course book. If Japanese students, even very proficient students, generate questions, they inevitably begin with “What is your favorite food?” and have a banal, but comfortable conversation. Nothing wrong with a bit of comfort food now and then. These lead to much more interesting and revealing conversations, move receptive grammatical and lexical knowledge into some classroom practice, and are more creative at each iteration. Students note down the elaborated questions and these more become stems/chunks/patterns for more interesting questions on the other typical chit-chat surface life topics of music, books, clothes, etc. for short conversations in future classes. You can still have the very comfortable topics, but prompt more sophisticated expression at each iteration. The next class, rather than “What kind of music do you like?” students soon come up with “What do you listen to when you feel tired/happy/stressed?” Then, the discussion can extend naturally from music to feelings, experiences, and stories. And the board fills up with the required language extending from music to emotions. But, we’re still repeating in the same area of discussion and building on the very pat early answers. Anyone else do this? Can anyone think of other restrictions on repetition besides duration or lexical? Gotanda, these are great suggestions, thank you. I wonder, though, whether creating novel utterances like this would qualify as repetition. Yes, as Scott wrote, it depends upon how much novelty comes in. And, that mostly resides with the students. Often with mixed level groups we can revisit a given topic several times with different partners/groups each time (25 students in my classes, so plenty of new opportunities). Some students are ready to work around the restriction (yes, Scott, not constriction) and elaborate a bit more at an early iteration, but others are not. The restriction is only in the question formation, so for the ones who need simple, direct repetition, OK, they can still participate because they know we are talking at least centrally about good food/music/comics/places to go, and repeat as often as needed until they are ready to improvise on the next iteration. Ideally, they are getting something from a near peer who is taking a chance. T. What do you typically have for breakfast? T: So, what do you have for breakfast? S1. Cornflakes with milk and fruit. T. What does [S1] typically have for breakfast? S2. Cornflakes with milk and fruit. S2: S1 has cornflakes with milk and fruit. T: And you, what do you have? Nothing very innovative there, but handled with a fairly cracking pace, and with other adaptations, e.g. more natural intonation, and increasing length of turns, this could go some way to providing freedom within constraint, or innovation emerging from repetition. Any constraints (restrictions) on repetition that mimic the limits imposed by time and space among language users (eg, in a hurry, shouting across a canyon, only so much room on the front page of the Times) would do the trick, wouldn’t they? The suggestions above are quite intelligent restrictions in that they follow a less is more philosophy that liberates rather than constrains learners and learning because, unlike simple drilling, the restrictions make room for singular rather than single form(s). Sorry, need to mention that restrictions on using certain lexis mimic differences in social distance and therefore require ‘grammaring’. When Billie Holiday used to sing in speakeasies they didn’t use microphones so as not to attract unwanted attention. To make sure everyone heard the song she would wander among the tables, singing it several times and always, so as not to get bored with the song herself, with subtle variations – or iterations. A different kind of blackbird. I think this is a wonderful analogy, and suggests to me the kind of classroom activity where groups are constantly re-shuffled but the task is held constant, so there are lots of iterations, each for a different ‘audience’. Going back to Scott’s blog post on drilling, I have been thinking about the lost techniques of audiolingualism. Can anyone recommend an old book on the various types of drills that were used in those days. I would like to learn more about them. 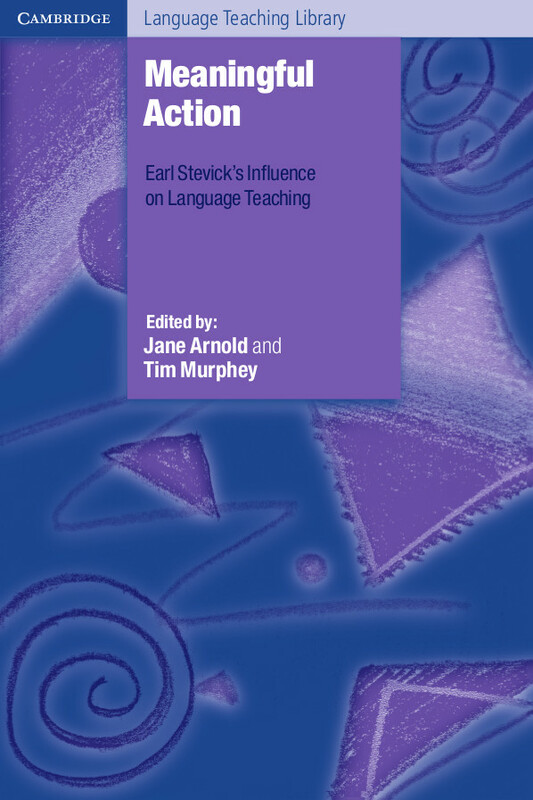 I’m pretty sure that there is a list in Richards and Rodgers ‘Approaches and Methods in Language Teaching’, but I don’t have a copy to hand at the moment. Anyone? I’d like to stretch the music metaphor a bit. Any musician knows that there’s a difference between repetition and rehearsal. Repetition is what you do on your own, most of the time, it’s a rather solitary experience, whereas rehearsal is a social, collective business. The one thing both have in common is focusing on a (testing) passage trying to nail down the various, problematic bits, often in preparation for a performance. When practising alone, the musician will go over the same passage again and again, so that the passage becomes ingrained routine. When rehearsing with others, you’re still playing what you’ve been practising, but the interaction with others will inevitable make it sound different, and you’re focusing on the whole score/tune. In other words, you’re not focused on the mechanics of the music anymore, but you’re striving to convey emotion. If you think about it, the same happens, mutatis mutandis, in a second language learning context. If the student has spent time practising language on their own, in preparation for a task, say, it goes without saying that s/he won’t sound the same when prompted to use the language in pairs/groups, not least because she’ll have brought to the task linguistic habits into shared consciousness. The trick as I see it, is making the students use these ingrained habits (formulaic language, say) in a meaningful context in which they can cooperate, interact, and exchange for mutual benefit. Here’s a couple of ideas: Task repetition in pairs with lipograms: asking the A’s to leave out the letter ‘e’ and the B’s leave out the letter ‘i’. Or the A’s replace the pronoun ‘I’ with 2+2 and the B’s replace the pronoun ‘you’ with 3 minus 1, etc. Thanks, Chaz … I very much like this distinction between repetition and rehearsal. I can see the latter being the stage whereby learned language becomes ‘portable’ language (referencing back to my response to Mark earlier). 4. ‘Players may creatively expand on utterances produced and repeated by one of the players’ (p. 159). The researchers conclude: ‘Our findings show that repetition emerges as a recurrent and frequent practice through which the players respond to salient and meaningful events in the game and display their own understanding and experiences of them. Even the simplest forms of repetition seem to offer opportunities for learning through enabling the participants to draw attention to details of language use. For instance, through repeating fixed phrases and constructions produced by game characters, the players collaboratively notice and pay attention to these and treat them as resources for play. Repeating and imitating meaningful chunks of language also enables the players to adopt them into their own repertoire so that the patterns may become available for recycling in other contexts’ (p.165). And finally, ‘through employing repetition as a resource for displaying and creatively adapting their competences to the unfolding circumstances of the gaming activity, we also suggest that players treat collaborative play as an occasion for a socially shared learning experience’ (p.166). Piirainen-Marsh, A. & Tainio, L. (2009) ‘Other-repetition as a resource for participation in the activity of playing a video game,’ Modern Language Journal, 93/2:153-169. 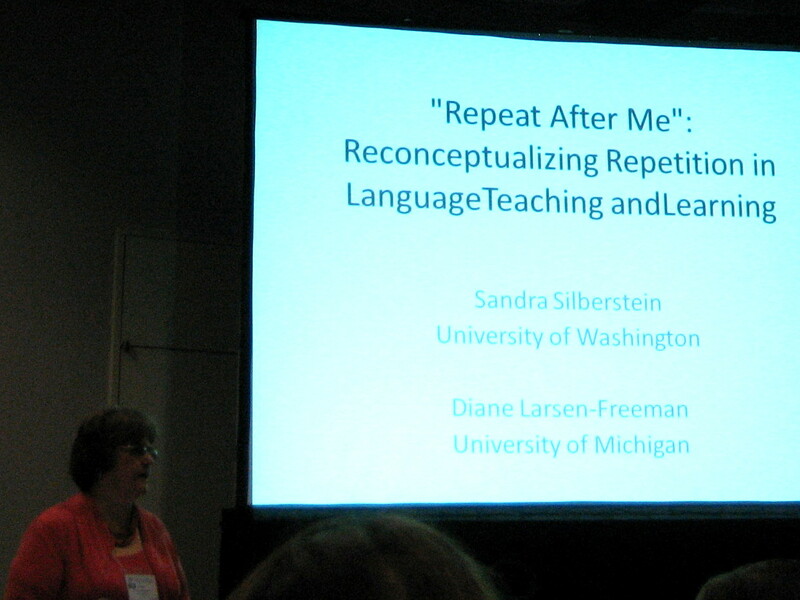 There are so many things about this study that leap out: not just the collaborative element and the ludic element, and the fact that the units of language learning are chunks; but the way repetition becomes iteration (utterances reappear like a theme in music – never the same twice); recontextualization of utterances (what Pennycook calls relocalization, as in the way hiphop migrates and adapts to new circumstances);and, finally, the way that the players appropriate utterances and re-fashion them for their own purposes. This all suggests a kind of pedagogic process of imitating, iterating, relocalizing and customizing – but all as part of the socializing process by which ‘participants display their membership in the local community of players and may also gain access to broader gaming communities’. Repetition generates innovation; innovation generates identity. The inflections of the blackbird define its territory. This is one of my favorite subjects. Are you by any chance familiar with Penny Ur’s introduction to (I think either but especially) the first edition of Grammar Practice Activities? As a novice teacher back at the advent of CLT, that book was one of very few that addressed the need for communicative form-focused practice, and the guidelines she listed there are still worth digesting today: quality, quantity, success-orientation, & heterogeneity. They add up to a design strategy for meaningful repetition, and when I try to rationalize why so few textbooks have picked up on this formal, or adapted/included activities from GPU, I usually conclude it’s because meaningful repetition is locally situated and as you write, unrepeatable. Using her guidelines, would you consider taking your ‘breakfast’ example above and turning it entirely over to the students as a time-limited survey-like activity, after modeling the q&a as you have shown? Doing this would allow all the students to embody the target structures. I’m using ’embody’ because I’m bringing some old and new thoughts together in my head that fit right in here with your blackbirds: Pierre Bourdieu’s *habitus* and Paul Driver’s reccent VRT Keynote “Embodiment, Technology, and Locative Play”. Hi Tom, thank you for mentioning (resuscitating?) Penny Ur’s criteria for successful grammar practice activities. In fact, I used to use these on the Diploma courses I taught years ago, as a rubric for gauging task design, before there really were such things (as rubrics for gauging task design). I saw Penny demonstrate the application of her criteria at a conference in Barcelona maybe 25 years ago! I was especially taken by the notion of heterogeneity – i.e. that a good practice activity should allow learners to participate irrespective of their different levels, abilities, etc. – the function of a practice procedure is to familiarise learners with the material, not to introduce it. – the more language the learners are exposed to or produce, the more they are likely to learn … We want to design procedures that will induce the learners to engage with the items to be learnt as many times as possible. – practice in general is most effective if it is based on more or less successful performance, and practice activities should be designed in such a way as to make it likely that learner responses will be acceptable. – it is … possible – and desirable – to design practice tasks that can be interpreted and performed at whatever level the individual student feels appropriate, so that some will be able to do more than others – in terms of both quality and quantity. – teacher activity in the course of the practice should … be largely directed towards supporting and assisting the students in their production of acceptable responses rather than towards assessing and correcting. – what kinds of features within the activity itself arouse learners’ interest and attention and make them want to take part in it? E.g. topic, visual focus, open-endedness, information gap, personalization, pleasurable tension … etc. Ur, P. 1988. Grammar Practice Activities, Cambridge University Press. So, yes, I think your re-framing of the pre-lesson chat as survey activity – once the initial topic has been broached, and some sample questions tossed around – is an excellent idea. And, as for embodiment, Bourdieu brings a new term to the table: hexis. I think it comes up in the comments in response to my post B is for Body.